← Say Hello to AfricaSIF! The TakeAway: CEO pay rises highest at firms that lead in layoffs, says a new report – a bitter pill to swallow in hard times. 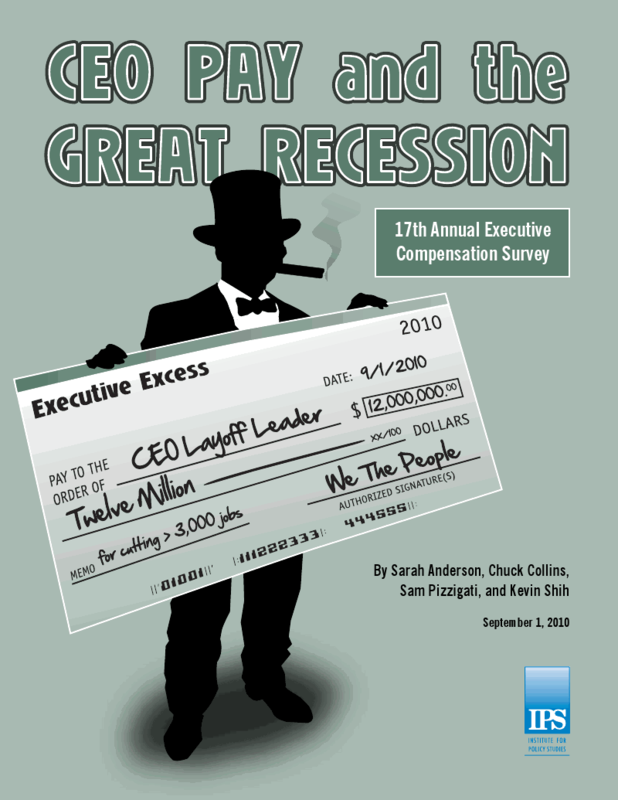 During this recession, there’s nothing like excessive CEO pay to get the blood boiling – particularly when viewed alongside widespread layoffs and the highest levels unemployment in decades (10.6 percent in January) . Yet that’s the reality the Institute for Policy Studies documented in its highly anticipated Annual Executive Compensation Survey, released yesterday. In its 17th year, the report (entitled CEO Pay and the Great Recession) identifies the 50 firms that laid off the most workers since the onset of the economic crisis in November 2008 –at least 3,000 workers at each through April 2010. The fifty top CEO “Layoff Leaders,” as IPS dubbed them, took home 42 percent more pay in 2009 – an average of $12 million –than their peers at S&P 500 firms, who pocketed an average of $8.5 million, according to an IPS press release. Pouring salt on the wounds, most announced these layoffs when reporting positive earnings. Mark Hurd of Hewlett-Packard: Hurd’s 2009 pay package totaled $24.2 million, before the $28 million severance given in exchange for his resignation earlier this month after controversy surrounding expense reports (a sign of graver governance problems). The report finds a correlation between layoffs and excess CEO pay, but not a causal relationship, as multiple factors contribute to the perfect storm of economic meltdown: Wall Street pressures to cut costs; a short-term investment mentality that measures productivity in quarterly units; an acute risk-averse climate that skews decisions in favor of a few. Recent Dodd-Frank financial reforms approved by Congress include provisions for shareholder Say-on-Pay and disclosure of pay gaps between CEOs and employees. However, corporate lawyers predict a “logistical nightmare” to implement the law, according to the Financial Times. Ultimately, corporate boards decide on executive compensation. Now that the SEC’s proxy access rulemaking gives shareholders a foot in the door to nominate candidates for board elections, the outlook for better boards looks brighter. But tell that to millions of Americans who’ve been jobless for weeks, months, and years—including the so-called 99ers who’ve been unemployed for 99 weeks or more, and continue to press Congress for yet another extension of unemployment benefits. The gap between those with little and those with a lot is widening. CEO salaries serve as a lightning rod, focusing energy on a dilemma in search of a solution. But fixing the problem requires far more than any given board or shareholder activist can provide. Escaping this quandary calls for systemic action. This entry was posted in Corporate Governance, Proxy Voting, Wage Gap and tagged 99ers, CEO compensation, Dodd-Frank, Hewlett-Packard, Institute for Policy Studies (IPS), Joe Uehlein, Johnson & Johnson, Labor Network for Sustainability, Merck, proxy access, Sarah Anderson, Say-on-Pay, Schering-Plough. Bookmark the permalink. Nice post, Marcy. Even though I don’t subscribe to the conclusions expressed in the IPS study, I appreciate the thoughful approach you’ve taken to this controversial topic. Regarding the notion that corporate lawyers have expressed that Section 953(b) of the Dodd-Frank Act will be a “logistical nightmare,” I happen to be one of those corporate lawyers who has been saying that since this provision was introduced! And, I firmly believe it. Setting aside whether you think this disclosure would be useful to investors when making investment decisions, you have to take into consideration whether companies can actually produce the data you are asking for. If they can’t, maybe there are similar data that companies are able to produce that will essentially demostrate the same trend you may be looking for. That’s a discussion I’m hoping people will be open to be having in the coming months when we all look at how to implement Section 953. Hopefully, we’ll all be able to set aside political and populist sentiments and focus on what makes the most pragmatic sense while still preserving the spirit of what was intended by the legislators. Happy Labor Day!